This video is based on the "Hello World" example and and incorporates a loop condition. The loop condition can be used to not create slides, if it does not evaluate to true. In this example the loop condition is used, to leave out every second slide. So instead of all 6 slides of the "Hello World" example only slides 1,3 and 5 (candidate values "A", "C" and "E") will be created. This video is based on the "Hello World" example and goes one step further. This example is about output file decomposition. While the original example created 1 presentation containing 6 output slides (1 slide per loop), this video shows one output file can be created per loop (so 6 files with 1 slide each). When using output file decomposition, other features such as adding segments or sorting slides locally (per loop run) can be applied as well. This tutorial video gives an overview of the SlideFab capabilities when it comes to automatically creating whole presentations and not just mere slides. The example is based upon the idea that for annual negotiations with the suppliers there should be a custom-tailored fact-based presentation for every supplier in order to prepare and support the negotiations, ultimately leading to better results (e.g. savings). Therefore a storyline is created which leads through the historic performance and culminates in a claim for the upcoming year. The video explains how custom formula-based slide titles and content can be created to really have a personalized look and feel beyond just showing charts and tables. As a result, based on 7 templates slides, 650 slides for 100 suppliers will be created (50 slides are not created for sake of story consistency using the slide condition feature. Basically it is about just not showing some suppliers how good they actually are 😉 ). Of course, this idea of custom-tailored presentations can be applied in other domains as well, e.g. when conducting surveys and using SlideFab to create feedback presentations for all participants or when running a decentralized project where individual work plans and instructions need to be compiled in larger numbers or on a regular basis through SlideFab. Please note: The video was created with SlideFab 1.7 which at this time was still known as SlydMkr. 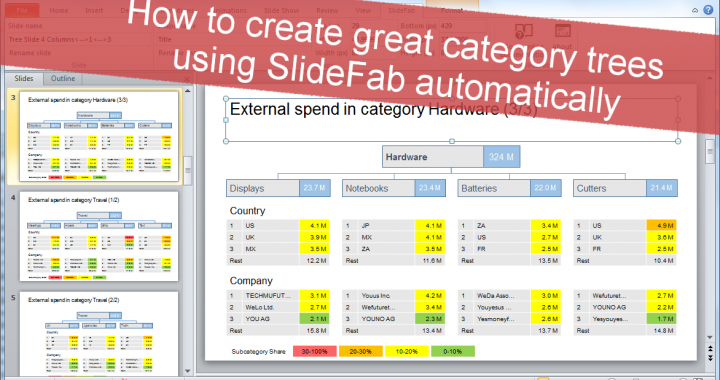 For the new features since then please refer to The most powerful Powerpoint automation tool got even stronger: SlydMkr / SlideFab v 1.8 released. The new SlideFab v1.8 introduced the Slide Loops feature which brought great flexibility and power. In this video a very simple example will be shown on how this function works. Spend data from a list of companies in Excel shall be copied over to Powerpoint in such a way that there is one slide per supplier. One slide - and if this is not enough? Indeed, in such cases SlideFab will take care and create as many slides a required in order to have everything covered.